Most web browsers and HTML-based email programs show linked text as underlined and blue, unless you change the default settings. Changing the style of your links is an important way to add visual appeal to a web site. While underlining is the default style for indicating links, most web site viewers are savvy enough these days to recognize colored text or bolded text as links. For example, on this blog my links are set to be green without an underline. There are many different ways to indicate links—and also rollover (hover) states—and these should all be well-considered by your web designer so they complement the design of the web site. Remember, by default, most HTML readers (ie browsers, email programs) will indicate links with blue and underlined text, unless your web designer has set the CSS style to something else. Leaving your links at the default blue underlined style is a red flag (or a blue one?) that your web designer did not take the time and effort to look at the details of your web site design. Don’t worry, if you are using Mail On The Mark, we always style your links for you so they are distinct and readable. This default link style makes your web site, and therefore your organization, look sloppy and unprofessional. At worst, it can make things pretty unreadable. 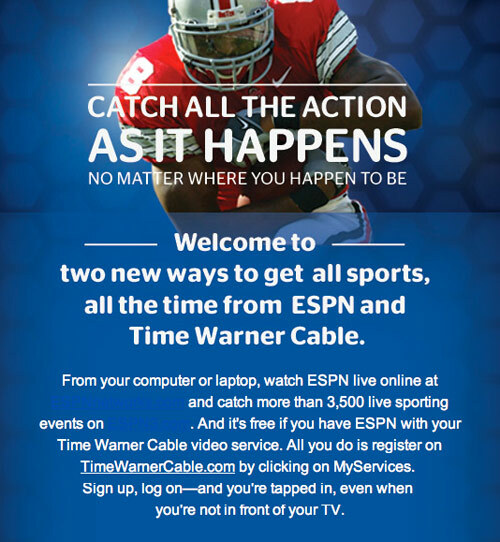 Check out this e-newsletter I received recently from Time Warner Cable. Not styling default colors, in my opinion, is lazy – namely as it represents the most basic elements of the Web.